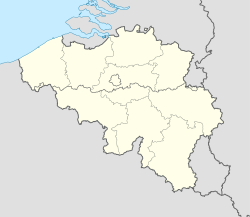 Auderghem (umwhile Dutch spellin, nou uised in French; pronounced [odəʁˈɡem]) or Oudergem (Dutch: [ˈɔudərʝɛm] ( listen)) is ane o the nineteen municipalities locatit in the Brussels-Caipital Region o Belgium. Locatit tae the sootheast o the caipital, alang the Woluwe valley an at the entrance tae the Sonian Forest (Forêt de Soignes, Zoniënwoud), the municipality haes a environmental advantage. Despite lairge roads slicin throu an the increasin treffic, it haes been able tae preserve a relatively important pairt o its natural an historic legacy: the creeks, the Abbey o Rouge-Cloître or Rood Klooster (Red Cloister) an its airt center, the Priory o Val Duchesse or Hertoginnedal (Duchess Dale), the Château o Trois Fontaines or Drie Fonteinen (Three Fountains), an the remarkable Chapel o Saunt Anne. Auderghem is adjacent tae the municipalities o Etterbeek, Ixelles, Woluwe-Saint-Pierre, an Watermaal-Bosvoorde. The municipality is govrened bi its 16t mayor, Didier Gosuin (FDF). Three forest veelages (Auderghem, Watermael, an Boitsfort-Bosvoorde), wur ane for centuries. In 1794, the sodgers o the French Revolution decidit tae separate these intae three diestinct municipalities. In 1811, Napoleon decidit tae reunite the three veelages, bi imperial decree, intae a single admeenistrative entity. But Auderghem wis athdrawn frae this union bi ryal act, leavin Watermaal-Bosvoorde on its awn. Thus, Auderghem became an independent municipality in 1863, wi anerlie 1,600 inhabitants. Wi the construction o the rail line linkin Brussels an Tervuren as well as, in 1910, the construction o the Boulevard du Souverain or Vorstlaan, modrenization came tae the municipality an the population grew quickly. In 1956, Paul Henri Spaak lead the Intergovernmental Conference on the Common Market and Euratom at the Val Duchesse castle in Auderghem, which prepared the Treaties o Rome in 1957 an the fundation o the European Economic Community an Euratom in 1958. The Castle o the Valley o the Duchess (Val Duchesse). The Priory o Val Duchesse or Hertoginnedal, a gift o the kieeng, is unfortunately rarely open tae the public. In 1963, Belgium's cabinet meenisters met here, plantin the seeds o a federalization o the kintra though at conditions fiercely criticised especially in some extremist Flemish naitionalist circles. Similarly, the Chapel o Saiunt Anne, whose oreegins go back tae the 12t century, is no open tae the public. Decommissioned in 1843, it wis sauld several times. Its splendid sculpturs frae the Middle Ages an notable period furnitur are still there tae admire. The municipality affers mony green spaces.